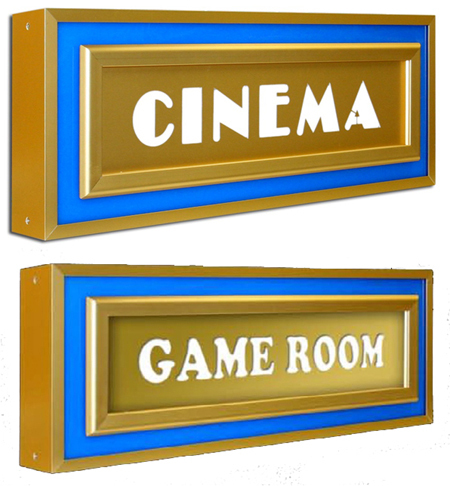 Update your Home Theater Interior Decor with our NEW Theatrical Design Metal Light Switch Plates. 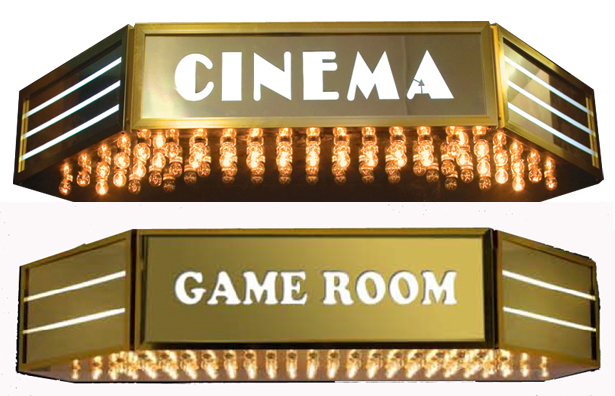 Available in FIVE Fun Theatrical Designs. Your choice of Small Hole Toggle, or Large Hole Decora Style Plate. This product usually ships within 1-2 weeks! 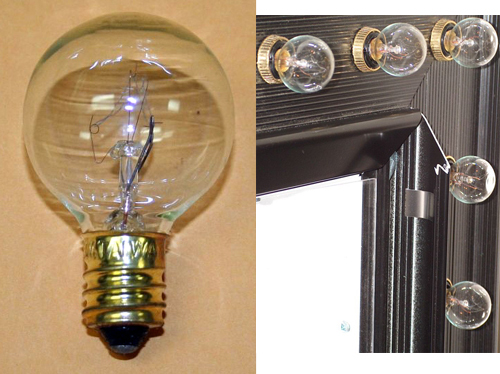 Beautiful, Curved Black Powder Coated Theatre Sconces add a Subtle Amount of Light to your Theater Room. The elegance of the powder coated finish adds a handsome decor accent to your room. Precision Laser Cut Custom Made-To-Order in the design ordered. Proudly made in the USA using the finest materials! Place your mouse pointer over the picture to view all available designs. This custom designed product usually ships within 2 weeks! 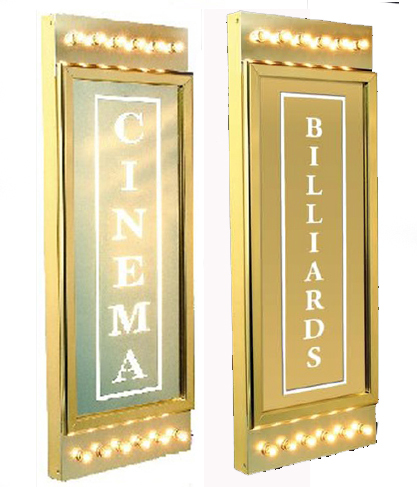 Beautiful, Curved Black Powder Coated or Silver Theatre Sconces add a Subtle Amount of Light to your Theater Room. The elegance of the powder coated finish with the cutout filmstrips on the sides adds a handsome decor accent to your room. 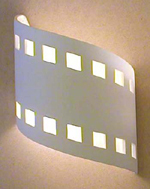 Laser-Cut Cinema Design Curved Sconces in Your Choice of EIGHT DESIGNS and either Textured Black or Stainless Finish. 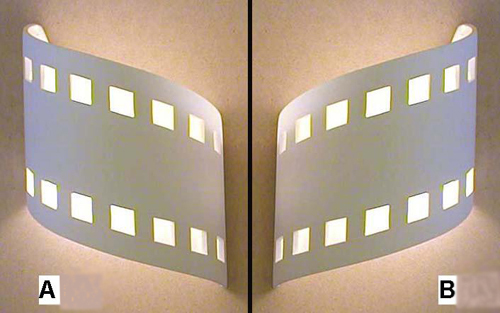 Decorative Filmstrip Cutout on the Sides. 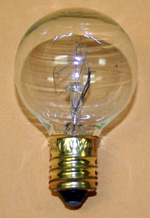 60 Watt Max Dimmable Incandescent Bulb (not included). 9 in. x 10 in x 4.5 in. 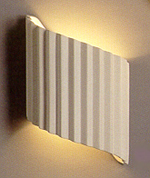 Curved, Laser-Cut Black, or Stainless Metal Light Sconce Highlighted with the DTS Sound Logo. 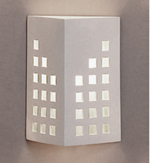 Mounts easily to a standard, recessed wall electrical box. 10 inches high x 9 inches wide x 4" deep. 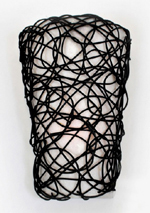 Available in a Textured Black or Stainless Finish. This product is custom made-to-order. Please allow 4 -6 week fabrication. 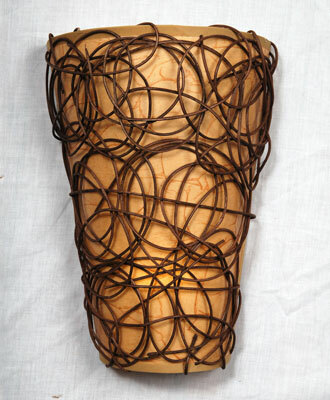 The natural, off-white bisque earthenware clay finish is beautiful as-is, or may be painted using any basic latex paint. UL approved and wired for a dimmable, incandescent bulb. Includes all parts necessary for mounting over a standard junction box. This made-to-order product usually ships within 10 business days! This product usually ships within 10 business days! 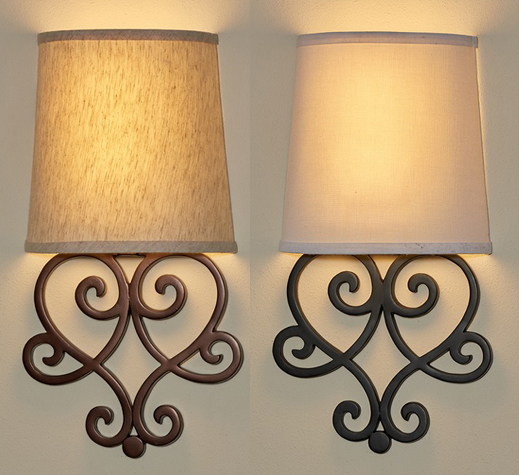 To Order One "A" and One "B" sconces, select A and B (one each), quantity 1. CYLINDER SCONCE with SQUARE PATTERN BORDER. A LARGER Sconce for your Theatre Walls. 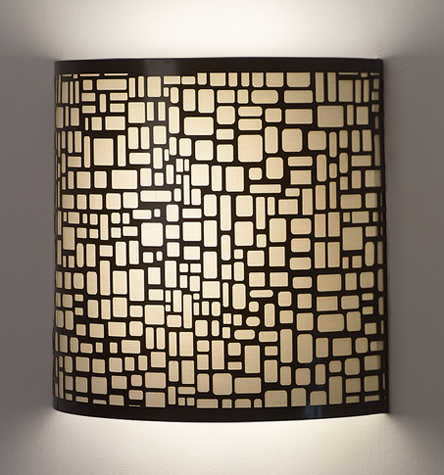 Our City Lights Contemporary Sconce Creates a Visual Appearance in its Patterned Open Squares and the Space They Define in this Eclectic Sconce Fixture. 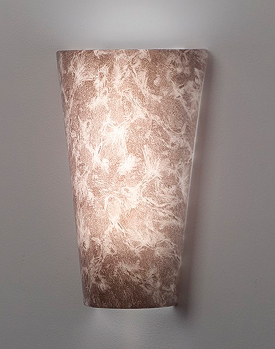 Each Sconce Hand Molded by our US Artisans. Natural Off-White Bisque Finish. Paintable with acrylic or latex paints. 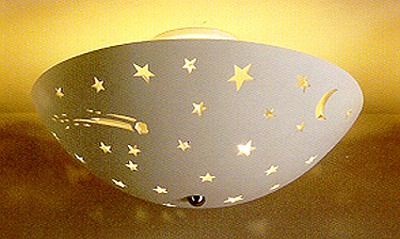 This Made-To Order Sconce ships within 1-2 weeks. 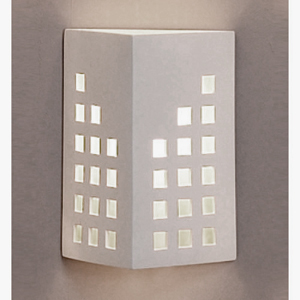 This Contemporary Block Pattern Cylinder Sconce Blends Three Sizes in Square Cutouts to Create a Contemporary Film Lighting Sconce. An Artistic Theatrical Movie Film Illuminating Effect! The Natural Off-White Bisque Finish is beautiful as-is or excellent for your painting with any Water-Based paint. 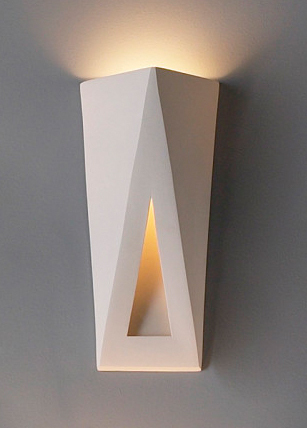 Our Triangles Contemporary Sconce is one of the Freshest Takes in our Sconce Light Collection. 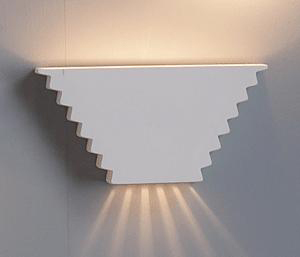 The Inspired Triangular Cutout Further Defines this Three-Dimensional Beauty which has a Bisque White Finish. 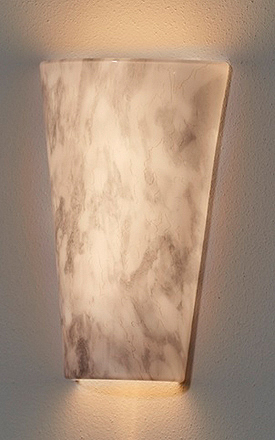 You can paint this fixture using latex and acrylic water based paints. Leave the inside in Bisque for a Perfect Artistic Look. The natural off-white bisque finish is beautiful as-is or excellent for painting. 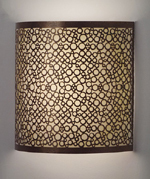 Our Faux Gold Finish Metal Sconce with Thin Bamboo Shoot Design. 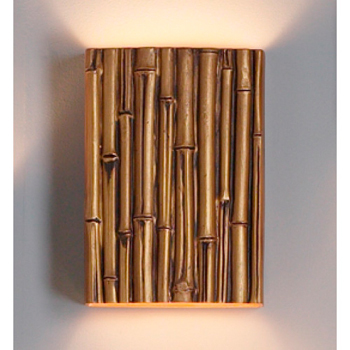 The 10 inch Thin Bamboo Reed Wall Sconce in Gold Finish is a Handcrafted Piece of Ceramic Art, derived from White Earthen Clay that is Bisque Fired by our Artisan. 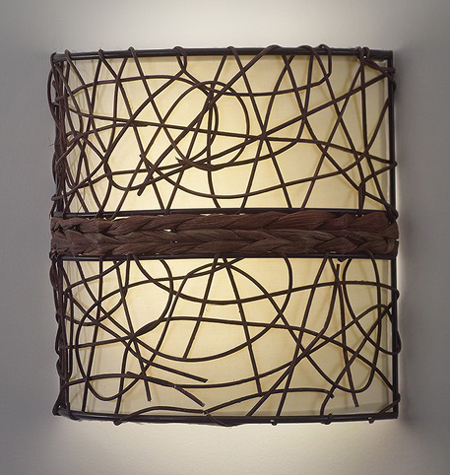 Although this Design takes on the Appearance of a Metal Sconce, the Character of this Fixture stays true to Unique Trendy Aesthetic. 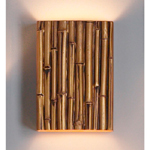 The 13 inch Thin Bamboo Reed Wall Sconce in Gold Finish is a Handcrafted Piece of Ceramic Art, derived from White Earthen Clay that is Bisque Fired by our Artisan. Authentic-Looking Metal Mini Spotlight and Projector Accent Lamps to light up and adorn your tabletop in your home theatre or media room. SPOTLIGHT LAMP AND PROJECTOR LAMPS LOOK GREAT TOGETHER! 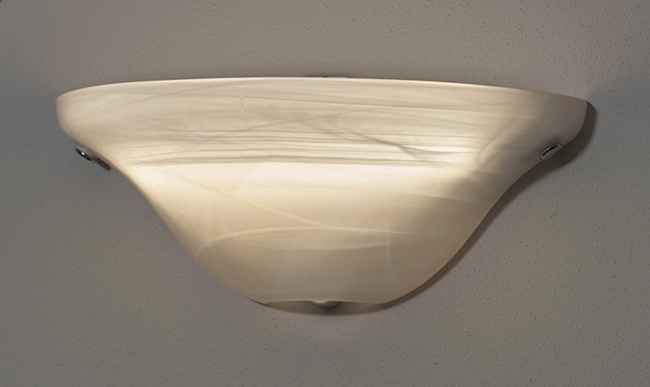 A Classically Styled Ceiling Light in Brushed Steel features a subtle, sensuous shape. 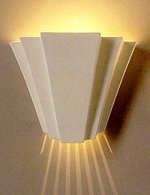 The Art Deco Ceiling Light Demonstrates a Sophisticated Take on Classical Lighting. The 3-Lamp Adjustable Fixture Has a White Frosted Glass 14 inch Diameter Shade That Can Hang From 14 inches to 56 inches From The Ceiling. Ceiling Mounted 70MM Movie Reel Light. Custom-Made 32 inch diameter Lights are fabricated from Authentic Goldberg 70MM Reels, With FOUR DOWNLIGHTS and ILLUMINATED FILM EDGE. Available in your choice of Silver, Chrome, or Black Reel. The top electrical and bulb enclosures are Black. 110V, and ready to accept threaded conduit connection – not included. 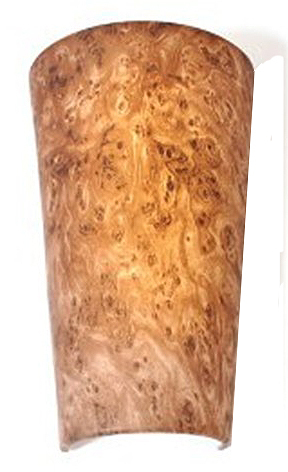 Will look fantastic in theatres with high ceilings or above large tables. Your choice of illuminating with four maximum 60 watt regular household Dimmable Light Bulbs (not included), or four long life dimmable installed LED Bulbs. Select Finish Color and Type of Illumination below. Please allow up to 3 weeks for fabrication. 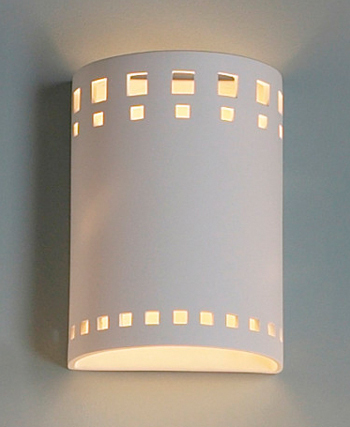 Ceiling Mounted Movie Reel Pendant Light. Custom-Made 18.5 inch Pendant Lights are fabricated with Authentic Goldberg 35MM Reels. 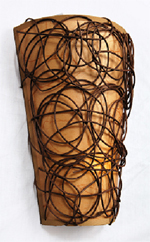 Includes a direct wire 120 inch adjustable height rope wire. 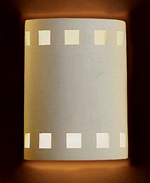 Base unit includes a generic illuminated edge film strip. Your Choice of Color Finish, and whether you want to use a maximum 100 watt regular household Dimmable Light Bulb, or an equivalent long life dimmable LED Bulb. 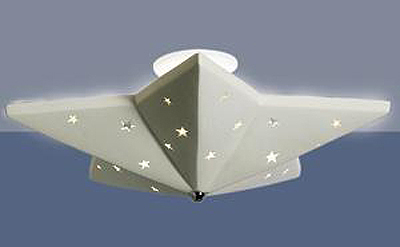 Star Ceiling Light with Star Cutouts. UL approved and wired for two dimmable, incandescent bulbs. 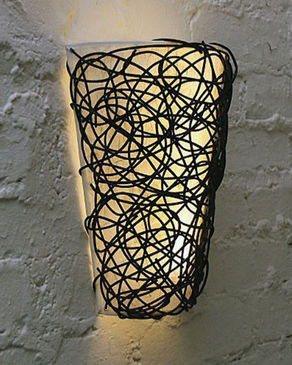 Black Metal Theatrical Night Lights. 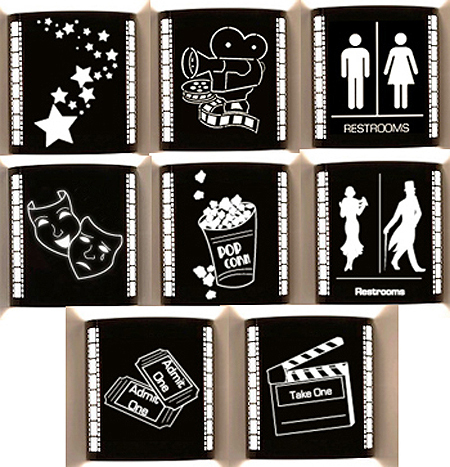 Our New Night Lights have an on/off switch, and are Custom-Made in your choice of FIVE Theater Designs. Place your mouse pointer over the picture to view all designs. 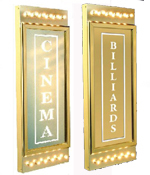 A Great Gift for the Stage or Screen enthusiast. 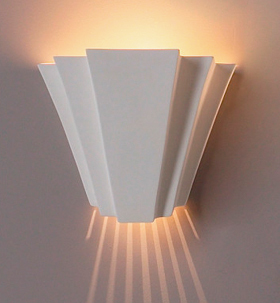 Battery Operated Sconce Light with Internal on/off Switch. --Long lasting Super Bright LED bulbs. --Easily installed, no drilling or cutting. Hangs like a picture - nail or adhesive hook required for mounting. Includes 4 hour timer – Can turn off automatically after 4 hours. Includes optional 24 hour memory, it can turn on automatically at the same time every day. A Manual On and Off switch is hidden behind the shade. 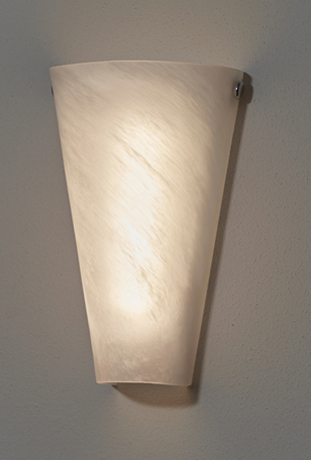 Acrylic High Gloss Printed Sconce. 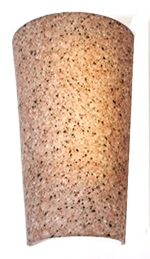 The Classic Look of Granite. 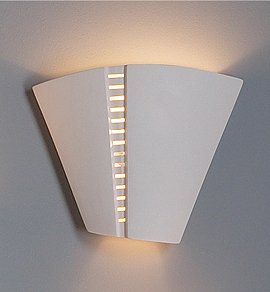 Battery Operated Wireless Sconce Light with Internal on/off and Flicker Switch. 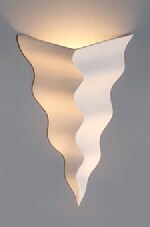 Our Helix Heart Scroll Art Sconce is a Beautiful Decorative Lighting Fixture that Adds Both Elegance and Ambiance. Its Ornate and Detailed Design Complements Classic and Contemporary Styles. Installation is as Simple as Hanging a Picture. Simply hammer a nail in the wall and hang. The 4hr automatic timer function means you’ll never have to remember to shut the light off. Easy and simple, Hassle Free Lighting at an Affordable Price. Dimensions: 10.5” W x 19” H.
Automatic 4 hour timer with 24 hour memory. Easy Push Button turns the Sconce on or off. 6 AA batteries required (not included). Battery Operated Ceiling Mounted Pendant Lights with 3 Stage Dimmer Remote. 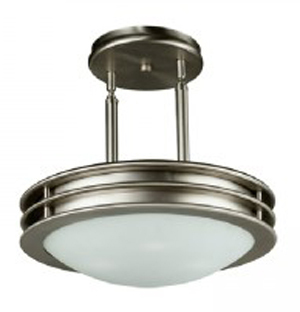 Simply Attach your choice of the Bronze or Brushed Nickel Metal Canopy with Alabaster Glass Shade To Your Ceiling and adjust the cord to the length desired from 8 inches to over 3 feet. --Remote Control On/Off Switch Included. --Long Lasting Super White LEDs. SORRY - THIS ITEM IS TEMPORARILY OUT OF STOCK. •	Includes 24 Hour Memory, if desired it can turn on automatically at the same time every day. --Two Dual Modes: White LED and Amber Flicker. --Long lasting Super White LED bulbs. 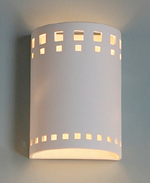 Conical White Moire Pattern Fabric Shade Sconce. 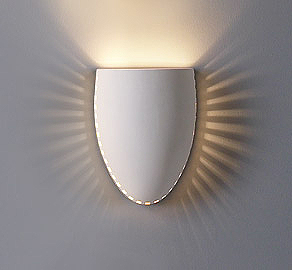 Battery Operated Wireless Sconce Light With Remote Control. Half Moon Shaped Frosted Marble Glass Sconce. Wireless Bente Glass Pendant Light With Remote Control. Powered by 24 Super bright LEDs that run on 3 D size batteries (not included). Dim or bright lighting is possible with a dimmer feature that provides 4 stages of brightness. A remote control is included and allows you to adjust the brightness and turn the light on and off. Energy efficient lighting timer can ensure your light will auto-shut off after four hours conserving battery life. 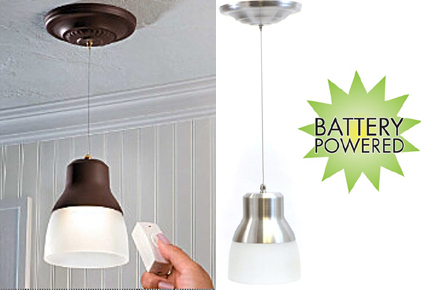 The pendant can be easily installed anywhere with two toggle bolts (included) and our adjustable cord from 8” to 44". Your choice of a beautiful Nickel or Bronze finish on both the Canopy and Lighting Fixture. SORRY - BOTH VERSIONS ARE TEMPORARILY OUT OF STOCK. 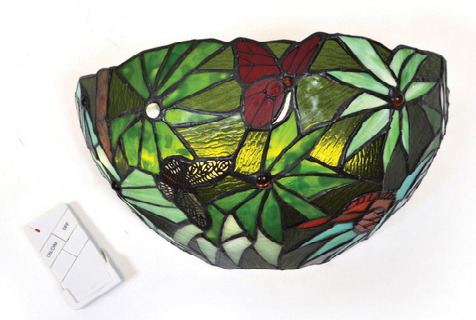 Tiffany Inspired Half-Moon Stained Glass Sconce with Jewel Accents. 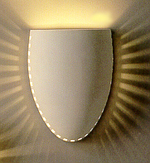 Battery Operated Wireless Sconce Light with Dimmer Remote Control. 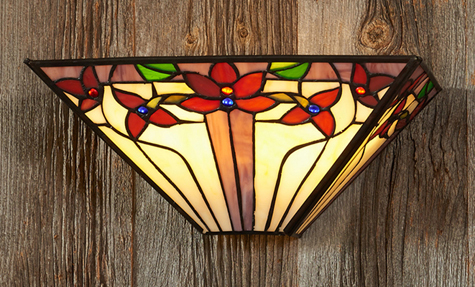 Half-Moon Stained Glass with Three Floral Roses. Operates over 200 Hours on one Set of 6 AA batteries (not included). Back Plate Contains 6 Long-Lasting Bright LED Bulbs. Red, Dark Blue, Green, Yellow, Blue, Turquoise, L:avender and Purple. Includes 4 hour timer - turns off automatically after 4 hours. 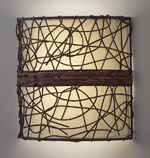 Our Wicker Barrel Art Sconce is a Beautiful Decorative Battery Operated Lighting Fixture that Adds Both Elegance and Ambiance. 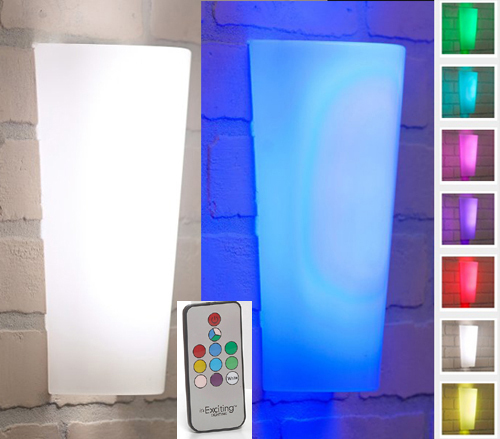 Easy to Hang Back Plate Contains 5 Long-Lasting LED Bulbs. Two Light Settings: White and Amber Flicker. Easy Push Button On and Off Switch is Hidden Behind The Shade. 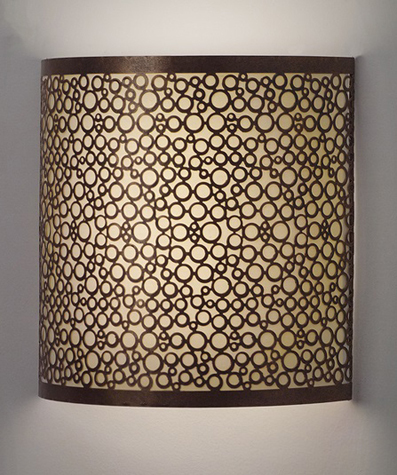 Dimensions: 10” x 10” x 4"
Our Circular Bronze Overlay Barrel Art Sconce is a Beautiful Decorative Battery Operated Lighting Fixture that Adds Both Elegance and Ambiance. 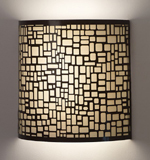 Our Geometric Black Overlay Barrel Art Sconce is a Beautiful Decorative Battery Operated Lighting Fixture that Adds Both Elegance and Ambiance. 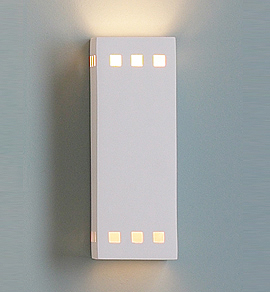 Battery Operated Wireless Sconce Light with 3 Stage Dimmer Remote Control. 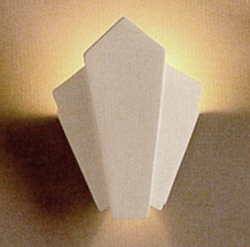 The Cambridge Motion Sensor Light is a battery powered light fixture. Add lighting in those hard-to-wire places like inside or outside your garage, basement stairways, dark corners, closets and more. 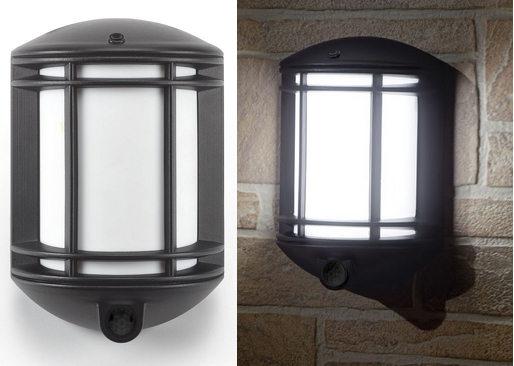 The Cambridge is easy to install so you can add lighting whenever and wherever you need it. 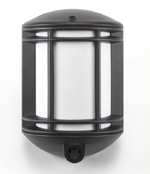 Contructed of Die Cast Aluminum with Frosted plastic lens. Equipped with 20 White LEDs powered by 3 D type batteries (not included). Two Brightness Modes and Optional light-up time: 30, 60, or 120 Seconds.